Having now settled in to our new showroom and have decided on a couple more product brands to fill in and around the Bontrager line up. Our first new brand is Tacx, we have become a Tacx Demo Center, we are currently stocking the Blue Matic, Satori Smart, Vortex Smart and Flux Demo unit as well as a range of Tacx add-ons, including turbo tyres, tablet holder, covers and heart rate straps. 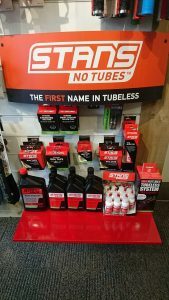 Due to the number of tubeless conversions we do, mainly due to all Trek bikes shipping with tubeless ready rims, we have a great range of Stans products in store. 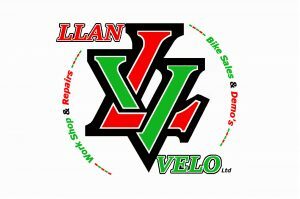 We currently charge £20 per wheel for the conversion, which includes tape and solution £25 if you require valves. We also stock the majority of Bontrager’s TLR (Tubeless) Tyres in store, these are backed up by Trek 30 day unconditional guarantee. We have had a busy run up to Christmas so far, there are good stocks of kids bikes and accessories and we can still order in before Xmas. There is a great range of gift ideas in store for the cyclist in your life, we have gifts to suit all budgets from the leading brands. We also offer gift vouchers for any of our products, accessories and workshop services for any amount you wish, the funds are held against the customers account and can be redeemed when you are ready. If you are passing why not call in for look and a chat and if we don’t see you….have a great Christmas!